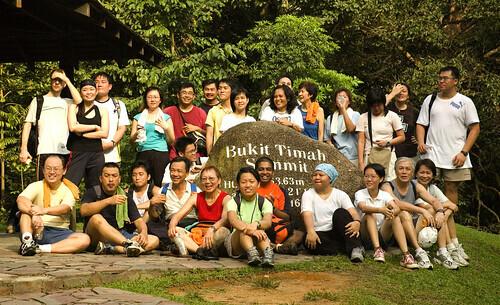 Last Sunday, we completed the 8th year of public MacRitchie - Bukit Timah briskwalks. This year, Raffles Museum Toddycat Muratti Pooh (as in "Pooh bear" she gently corrected me) waylaid us at the summit and took photos as we completed the ascent. She will be there on the next walk as well. I like this happy photo! Kiat, Kai Scene and Chen Kee grabbed some photos along the way. They all know the drill, even Kiat who was helping out for the first time, and everyone sent me photos by yousendit or gmail either the same day or the next! So by Monday, I could point to all the albums via Habitatnews and the Briskwalk webpage! Kai Scene has emailed participants and they must have had fun looking for their photos. I like publishing event photos early so people can view the photos, show friends and family or blog about it. And I will have one less burden of my mind! I took a couple of photos myself, courtesy of my handphone, and despite the low light and absence of anti-shake, there was enough to capture some ambience of the walk. In this one below, we met a husky along the way. Of course I rubbed him down and left with lots of fur and a stench that the others could smell when I caught up with them!